There! Things are finally coming together, literally, as the front and back are finished at last, and the shoulders joined. Now it starts to look like a gansey, even without the arms and collar. In any case, it’s just not an issue for me. Leaving aside the question that a nicely-shaped neckline adds a certain style to a gansey, I hate having wool next to my throat – can’t bear it. Maybe it’s because I usually have a sort of stubble down there (life’s too short to shave regularly), but it scratches. So I always go for a lower front neckline. The pattern will normally dictate the depth. In this case, I decided to finish the current diamond, which meant that I only had a dozen rows to play with before having to start the shoulder straps; so it’ll be a shallow neckline, as befits these austere times, and I’ll have to think about buying a stylish scarf to wear inside the collar. To get even a modest curve in the neck I had to decrease every other row, giving me 6 decreases leading in to the shoulder; it doesn’t sound a lot, but it’s just enough to take some of the four-square rectangle-ness out of it and soften the shape. 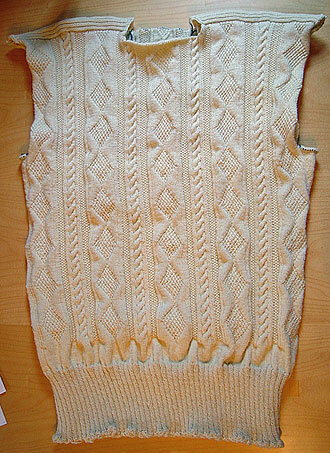 I divided at that point, working back and forth on double-pointed needles as I did on the back, decreasing every other row for 6 decreases, then concluding with the shoulder strap as before (12 rows rig and fur’). When I’d finished the first shoulder this way, I joined it with its counterpart on the back, before returning to finish the other front shoulder (see photos). It really doesn’t matter which way round you do this – finish all four shoulder-straps and then join them together, or do as I’ve done here, cast off each shoulder as it’s ready. One reason why I like to join them as I go is because you have the yarn ready in your hand when you finish the last row of each front shoulder-strap: you might as well use it to knit the shoulders together, and it’s one less yarn end to darn in later. Speaking of the last shoulder-strap row, it’s a good idea to knit this a little looser than usual, as it makes it easier to knit it together with its counterpart when you join them and cast off. 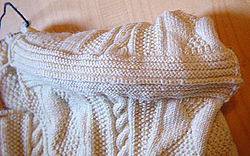 To cast off the shoulder, start with the front stitches on one double-pointed needle, and the back stitches on another. Align them side by side, with the stitches next to each other. Take a third needle and carefully insert it through the first stitch on each needle; loop some yarn over it, and withdraw it back through the two stitches, slipping them off their needles as you withdraw. You’ve basically knitted them together, and have a (new) single stitch on your third needle. Repeat the process with the second stitches. You will now have two stitches on your needle. 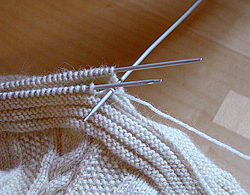 Slip the first stitch OVER the second and, in so doing, cast it off. And so on, until all your stitches have been knit together/cast off; finally, cut your yarn and thread it through the last stitch and pull it tight and there you are. Sorted.